Based on the tune of ‘Waltzing Matilda' and the legendary myth of the bunyip, the film portrays Australia's distinct outback environment and characters using a unique style of stop-motion animation. The original poem was written by Elisabeth Edser, as a parody of the Australian ballad 'Waltzing Matilda', but developed into an entirely different script, with a meaningful environmental message. The original poem was significantly changed to suit animation production. 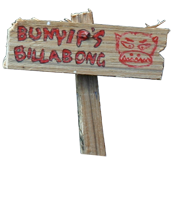 The Bushman of Bunyip Billabong tells the tale of a careless swagman, who learns his lesson for disrespecting the environment. The Swagman arrives at a waterhole and describes the place as a "dump", in his typically 'Aussie' accent. He then begins a whole series of environmentally damaging acts including littering and blasting his stereo at full volume to disturb all the native wildlife, especially the "bloody maggies" (magpies). He even ends up shooting some defenceless kangaroos. But his presence didn't go unnoticed by the resident Bunyip. The hideous creature, based on an ancient Aboriginal myth, rises from the waterhole, seizes the swagman and drags him into the water. The legendary tale finishes with the narrator saying, "His ghost may be heard as you pass by the billabong..." before the Swagman rises as a ghost out of the waterhole and delivers the films environmental message. The Bushman of Bunyip Billabong has screened in 30 film festivals around the world and picked up 14 awards, including the 2005 BUFTA scholarship award and best secondary animation at ATOM 2006. For a full list of screenings and awards click here. People often can't believe it when we tell them that 350 hours of work went into just 3 minutes of screentime, but that is simply what's involved in the painstaking process of stop-motion animation. We made this film as Cameron's year 12 art project. As it was a major assignment for the subject we had all year to work on it, and this is what we did. The first step was creating the set, which we did without really any idea of what the story was going to be about. We just wanted to make a swamp. So we set out sticking a whole lot of styrofoam onto an old door frame, which we then covered in a mixture of dirt, glue and water that dried to form the ground. Trees were made with sticks and paper-mache and then painted. The sky structure was built to hold up a curved piece of plastic behind two sides of the set. The swamp water itself is actual plasticine melted and poured in. By the time we'd finished the set an idea for the story had come to me. Cameron's mum, Elisabeth, had written a poem parodying Waltzing Matilda. We took this, played around with it, and came up with an idea for a film about a not-so-jolly swagman who gets taught a lesson for disrespecting the environment by the resident bunyip, who lives in the billabong. With the story in place, we could then get on with making the characters. 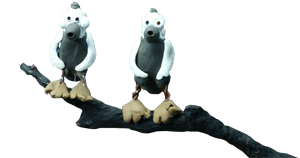 The hand-crafted models are about 15cm made mostly from plasticine, with lots of tiny details made from other materials, such as beads for eyes, and the ends of pins for teeth on the bunyip. We then recorded the voices. As apposed to most live-action films, we created the soundtrack before the production so that the correct mouth shapes could be shot to achieve the right lip sync to dialogue. This involved creating an original score based on the tune of Waltzing Matilda. To do the recording we played this tune to the voice artists for them to get their timings. Then came the actual animation. This involved taking an individual image for 25 different frames, moving the character a tiny amount between each one. We shot the film on a Canon 300D digital SLR camera and edited it on Sony Vegas Video. Often one shot took a whole day to create. For example, the opening shot of the film, which we had to shoot twice before we got it to work. It involved an intricate setup where a light was placed directly behind the plastic painted sky to look like a sun when shone through it. It was mounted on a tripod and raised a slight amount each frame to make it rise over the horizon and simulate a sunrise. To make this more realistic, as the sun rises, the key light was placed on a dimmer switch, which was increased frame by frame to increase the overall light on set. Then we did another take from the same camera position of a bird flapping its wings in the distance out of focus. This bird was then cut out frame by frame in photoshop and pasted in the right position to make it look like it was flying in and landing on a branch. For some shots we had to create different sized duplicates of parts of the characters. For instance the ‘tin can' shot, which required almost a life sized hand to open a real tin and the shot of the bunyip's head rising from the swamp, which was shot in reverse with the swamp water plasticine semi-melted so the head could just be pushed down into it. For a few shots we used a dolly device to move the camera incrementally. We placed this on all sorts of angles to create pans, tracks, simulated crane shots and even a zolly, which took about 3 hours to set up, timing it to perfection to get the incremental zoom perfectly in time with the camera movement. People often ask what motivates us to spend all day for a few seconds footage but to see it work is a great feeling and makes it all worthwhile. It's easy to go insane stuck in a small room doing something very repetitive all day. After a few hours you begin to catch what we call the ‘Animator's Disease', which is when you start saying completely random things that make very little sense to anyone. Nevertheless, we both find them extremely amusing at the time. The problem comes when you don't have another animator there helping you. This is when you find yourself saying these stupid things to characters and sometimes, depending on how insane you've gotten, actually getting a response. Surprisingly, we have spent a lot more money promoting this film than we did on producing it. 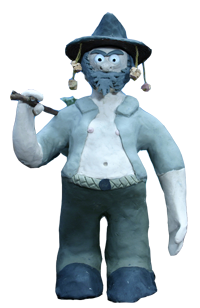 It cost about $100 for all construction expenses, such as plasticine for characters and plastic for the sky. A lot of the craft materials like paint were conveniently supplied by Cameron's school Concordia College , where we constructed most of the set. Then we bought our $1500 camera specifically for this film and used an expensive computer and dolly device. However, we still like to say this film had a budget of $100. Since finishing it we have entered about 50 festivals worldwide, spending $1500 on entries fees and postage. This has been more than worthwhile, as it has been screened all over the world, winning some great awards, including a full scholarship to Bond University, which Cameron attended over the next 2 years. It has also helped us win $15000 in the Nescafe Big Break awards to assist us in starting up an animation studio in Adelaide , so that we no longer have to do things on such a tight budget. The film has now been screened in four different continents, including such prestigious film festivals as The Stuttgart International Festival of Animated Film and The Ottawa International Animation Festival. For a full list of screenings and awards, click here.